Written by sylvia borgo on Monday, September 10th, 2012 at 9:30am. 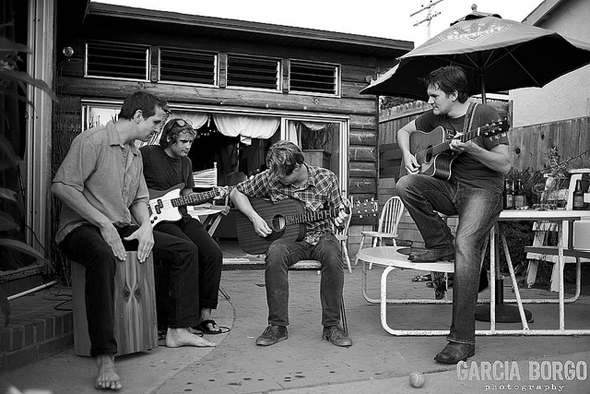 Tonight at the Casbah, North County’s the Paragraphs will showcase songs from their upcoming debut LP, +/-. Last week, O&B’s Sylvia Borgo interviewed the band — Jesse Lee Hoffbauer, Michael Hunt, Abel Perez, and Adam Feilmeier — and they discussed their musical influences, the writing and recording process, not playing for the Yankees, and their plans for the future. Check out the band’s first single and the interview above, and Sylvia’s photos below. Great photographs and article Sylvia! You do tremendous work for these bands! Awesome image to accompany a great song! Lots of incredible talent featured in this blog post! I hope we get to see (and hear) more from this group! LOVE this imagery! Fantastic photographs….I feel like I was there! The photos are awesome! What a great opportunity to be able to interview AND photograph such a talented band!!! WoW. “There’s Nothing You Can Do” is HOT! What an amazing opportunity to hang out with and interview The Paragraphs. The photos are the icing on the cake to this great music and interview. What an awesome interview and those pictures are to die for! I love the photojournalistic feel of them! I’m off to check out their other music, loved what I heard so far! Dang. Just listened to to “There’s Nothing You Can Do.” LOVED it. Aha! You got the MP3! Yeah!! Make your way to their next show here in San Diego to listen to more great songs live! They play House of Blues on October 16. Love “Nothing You Can Do”! Even my seven year old daughter had to run in here to see what I was listening too. LOL. Really love their sound. And the photos are awesome too. So glad that I came here this morning. I always love stumbling across new music! I have such a wide variety of what I like so it is awesome to be introduced to new things! THANKS! Love the images. Browsed through them as I was listening to the interview and MP3 and I almost felt like I was there hanging out with the band! Very cool! Thanks for taking a look and listen! The Paragraphs are a super cool and easy band to hang out with, great bunch of guys! Loved the interview! It’s neat to hear questions from a non-musician but from someone who clearly has a huge love and knowledge of music. Great images and great interview! The Paragraphs are cool! Wow, these guys are awesome! I had never heard of them, but just went and found their music and freaking love it! Just did the free download. Is there a full CD somewhere available? So glad you did this interview and the photos are GREAT! Such a good photojournalistic eye you have!